A blog post from one of my favorite publications, Cloth Paper Scissors, prompted me to look around my studio ‘area’ to see what storage and display ideas I love best. I found this three tier wire stand at World Market and the lazy susan at Target. 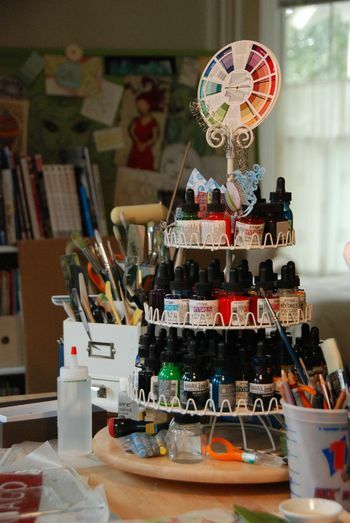 It makes a colorful and dizzy display of watercolor and acrylic inks within easy reach. The bottom tier needed a paper liner to keep the bottles from tipping. A piece of 140lb watercolor paper cut to fit and no more tipping.